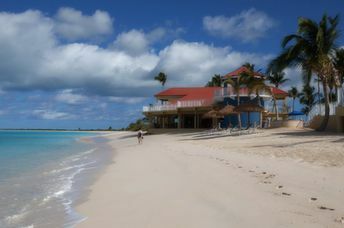 This beach ranks #2 of the "Best beaches in Barbuda"
The Lighthouse Bay Resort Barbuda is the only hotel in the area. The hotel is expensive but worth the money. Fly to Antigua International Airport (ANU). Next fly to Barbuda Airport (BBQ). There is also ferry service from Antigua (St. John's) to Barbuda - Barbuda Express (except Monday and Wednesday). A hotel representative will meet you by appointment. Also you can be taken by the helicopter from Antigua airport (ANU) directly to the hotel. Any time of the year. Keep in mind that from June to October hurricanes are possible.